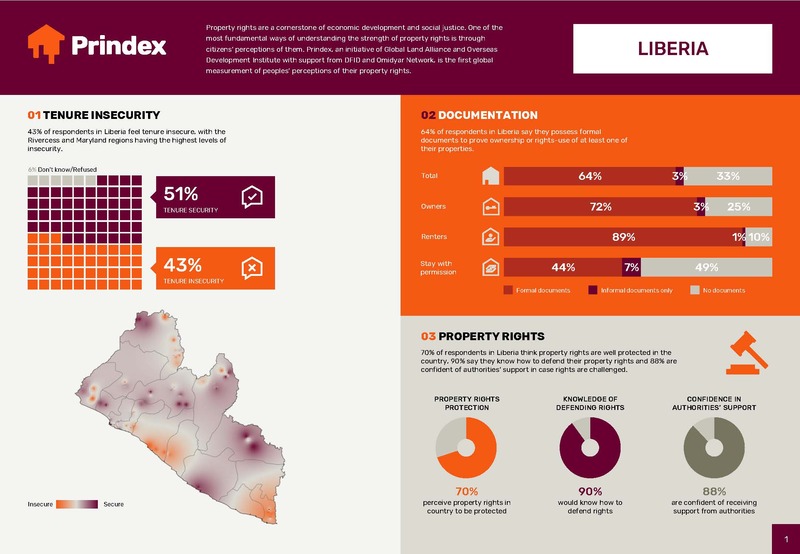 PRIndex is a joint initiative of the Global Land Alliance and Overseas Development Institute and gathers data on perceptions of property rights in different countries. Together with them, we conducted a study on property rights and tenure insecurity. In an iterative process, we aimed to develop and identify the most methodologically robust and accurate way of measuring perceptions of tenure security. Then in 2018, we were finally able to field the first surveys. The study took place in 15 countries, with 10 countries from Sub-Saharan Africa, four from Latin America and one from Southeast Asia. It isn’t possible to draw globally comparable conclusions or policy recommendations on this limited sample size from just the first wave. However, the report provides country-level snapshots of citizens' perceptions and might spark a conversation on a national level. By creating infographics for each of the15 surveyed countries, Factworks transformed the results into a visual form that makes the results more accessible. These infographics provide information on tenure insecurity and the reasons for this insecurity. It also provides further details by taking gender, location and tenure type into consideration. Another illustration shows what percentage of people own formal documents to prove ownership or at least rights-use of at least one of their properties. If you want to learn about the specific numbers take a look at the infographics.